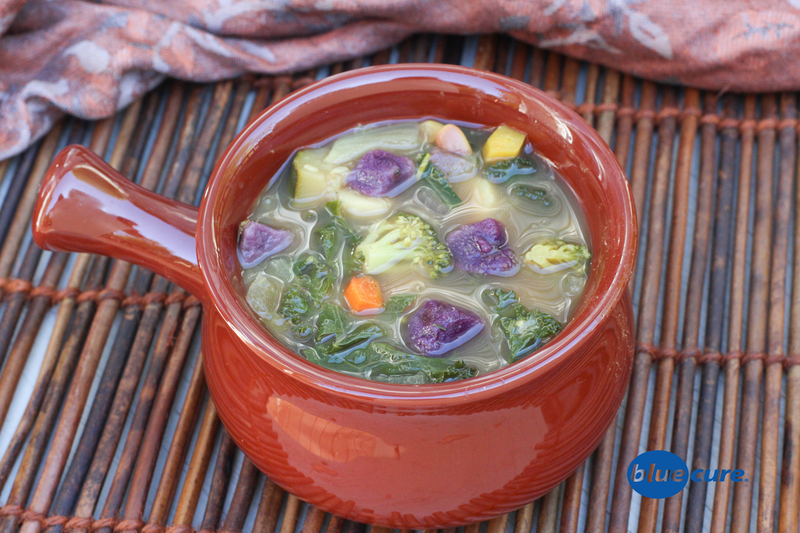 This vegetable white bean soup is a delicious way to pack in more veggies. It’s a savory, meatless meal that’s packed with flavor and is hearty, thanks to the potatoes, beans, and tempeh. Enjoy it with purple or orange sweet potatoes to pack in the cancer-fighting antioxidants. Pictured here is the soup served with purple sweet potatoes. Purple sweet potatoes are a great source of the phytonutrient called anthocyanin, which is also found in blueberries. Anthocyanin may help slow brain again and improve overall brain health. They also appear to offer the most anti-inflammatory effect in the body. **The purple sweet potatoes lose color as they sit in the water. I would suggest roasting these in the oven and adding them in when you eat the soup to help retain color. Wash and chop all the veggies. If using purple sweet potatoes, roast in the oven at 350F until soft (~25-30 minutes). Sauté the minced garlic in a pot with 1-2 Tablespoons of water. Add in the onions and continue to sauté. If using orange sweet potatoes, add them in next. Once the potatoes start to soften, add in the carrots and the broccoli. Continue adding small amounts of water, as needed, to help keep the veggies from sticking. Avoid adding too much water at once, as it will make the veggies soggy. Leave the veggies a little under cooked, as they will soften when they boil in the water. Add 4 cups of low sodium or homemade veggie broth and 4-6 cups water to the pot. Drain and rinse the beans, add them to the pot. Next, add in the rosemary, thyme, and nutritional yeast. Add in the kale and spinach. Heat the soup on medium heat until for ~20 minutes. Adjust seasonings for taste. (Note: the soup will taste best the second day as the seasonings start to come together). Dish the soup into bowls and top off with tempeh bacon pieces and crushed red pepper, if desired. Enjoy!